Spotify will hold its direct listing on the New York Stock Exchange on April 3. RBC Analyst Mark Mahaney believes Spotify will leverage its position as a “global music streaming leader” thanks largely to its scale and data, which should help the company become profitable. He sets his price target to $US220 per share with an “Outperform” rating. Come back here to find out how Spotify’s stock is trading in real time. Spotify is poised to take the global music streaming industry by storm as the company prepares to go public. The company’s sheer scale of 71 million paid subscribers and an additional 92 million ad-supported monthly users puts it solidly ahead of its closest competitor, AppleMusic, with nearly double the amount of paid subscribers. “Spotify is the global music streaming leader,” wrote Mark Mahaney, an analyst at RBC, in a note to clients ahead of its direct public listing on April 3. 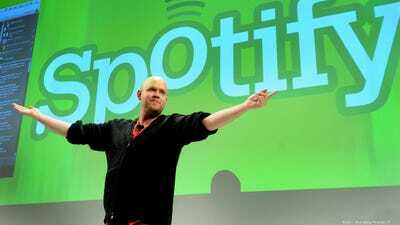 Mahaney initiated coverage on Thursday, giving Spotify a $US220 per share price target and an “Outperform” rating. “Scale matters,” he said. Scale can help an internet company like Spotify because it creates a loyal fan base through personalisation that can further spread to others through social features that allow users to share their favourite playlists and artists with friends. Its position and scale could also help move it out of the red as the music streaming company can use its increasing leverage as a leader to negotiate better deals with the music industry and incentivise labels and artists to promote on its platform. This can help alleviate some of investors’ concerns over the company’s billions of dollars of spending on royalties and licensing fees because its business model is starting to inflect with higher margins and revenues, Mahaney notes. Data and personalisation can also boost its projected success, Mahaney says. Spotify’s large data trove can lead to further personalisation for users, as well as monetisation. Spotify has a data set of more than 200 petabytes compared to Netflix‘s 60 petabytes, Mahaney adds. “Why does this matter? We all know information is power, and for many it helps bridge the gap between the struggling and the successful,” Spotify CEO Daniel Ek told investors. Not only can this data be used by advertisers, it can also be used by artists who can gain insight into how users are listening to their music and which songs they skip. “This is a flywheel that keeps on turning,” Mahaney wrote. You can view Spotify’s stock price in real time after April 3. Read more about another way Spotify can save itself from haemorrhaging money to the music industry.